In April of 2014 a new, highly pathogenic H5N6 virus emerged in Sichuan China, infecting a local poultry flock and killing one man. This was actually the second new HPAI H5 virus to emerge in the first half of 2014, with Korea's H5N8 starting 3 months earlier. Over the next 18 months China would report three more H5N6 human infections, and a number of outbreaks in poultry. Laos and Vietnam also reported poultry outbreaks, but no human cases (see FAO Warns On H5N6). While human cases have been rare, last December and January we saw 5 cases reported from Guangdong province, followed by another in March. In April Hebei and Hunnan province each reported cases, and just yesterday Anhui province reported their first case. Although these cases have all been widely scattered, and we've seen no evidence of clustering, or human-to-human transmission, this is a noticable uptick in cases. Like all influenza viruses, H5N6 is constantly changing. This evolution is driven by two different processes. Antigenic drift & Antigenic Shift (reassortment). Shift occurs when one virus swap out chunks of their genetic code with gene segments from another virus. This is known as reassortment. 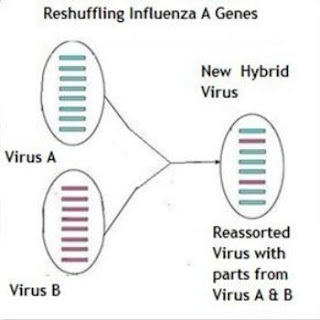 While far less common than drift, shift can sometimes produce abrupt, dramatic changes to the virus (see NIAID Video: How Influenza Pandemics Occur). With only four human samples availble for analysis until last December's upsurge, we haven't seen much data on how the H5N6 virus is evolving, although reports last summer (see H5N6 Rising: Infecting Birds, Humans, & Even Cats) raised some red flags. Today, a letter in the EID Journal finds while H5N6's HA (H5 clade 2.3.4.4) and NA (N6) genes have remained fairly stable, its internal genes have changed since 2014. The viruses sequenced last December show that H5N6 has reassorted with other avian flu viruses (both H9N2 and H6N6), and suggest there may be other - as yet undetected - H5N6 reassortants in the wild and others may yet emerge. Two of the three 2015 isolates also appear to have picked up genes for amantadine (an older antiviral) resistance, that were not present in 2014. None of this means that H5N6 is ready for prime time, or even that it is poised to become the next big avian flu threat. But its high morbidity and mortality in humans, along with its rapid spread and increasing genetic diversity, make H5N6 a virus worthy of our attention. I've only included some excerpts from the letter, so follow the link to read it - and the supporting material - in their entirety. To study the genetic basis of continuing human infections with this avian influenza subtype, we sequenced the complete genomes of 2 of the 4 human H5N6 isolates obtained in December 2015 in Guangdong Province. We compared these sequences with those of 1 H6N6 and 8 H5N6 influenza viruses isolated from birds in live poultry markets in this region during 2013–2015 (Technical Appendix[PDF - 1.63 MB - 12 pages]) and other published genomes of H5, H6N6, and H9N2 avian influenza viruses (Technical Appendix[PDF - 1.63 MB - 12 pages]). 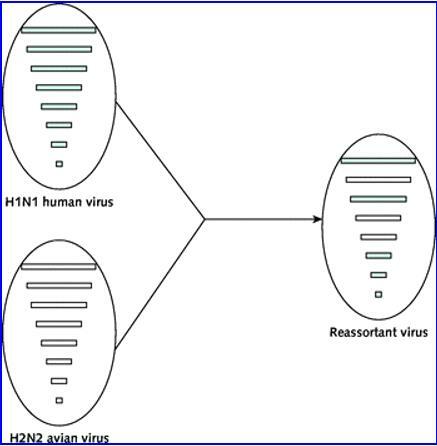 In summary, we isolated 2 novel reassortant H5N6 viruses from 2 patients in Guangdong Province, China. The internal genes of these strains are different from those found in the first wave of H5N6 infections in 2014. The PB2 of 2 human isolate A/Guangdong/ZQ874/2015 (H5N6) appears to have been derived from a duck H6N6 virus, and all other genes of this virus originated in circulating H5N6 viruses. In contrast, the 6 internal genes of the other human isolate, A/Guangdong/SZ872/2015 (H5N6), were derived from enzootic H9N2 viruses. Although human infection has been sporadic, the co-circulation and reassortment of this virus with other enzootic low pathogenicity influenza viruses has resulted in new reassortant viruses. Further surveillance of birds is needed to monitor the spread of this novel virus.